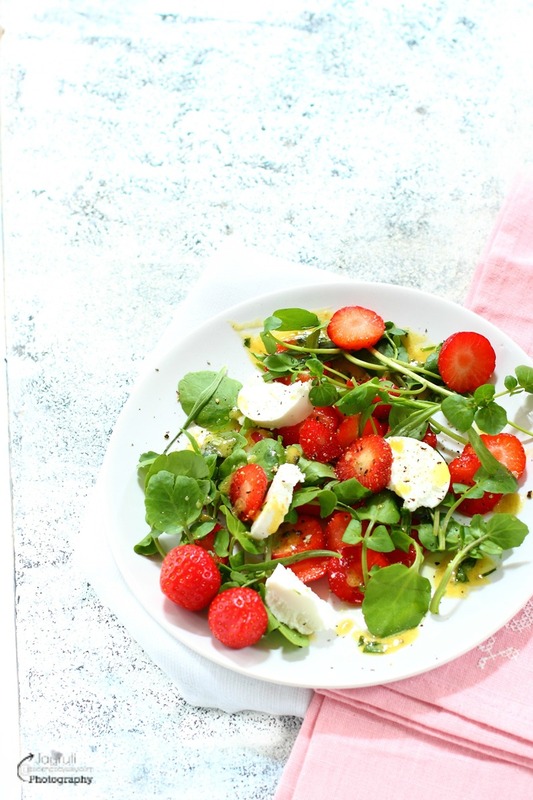 This summer season you can have a french inspired strawberrific salad, featuring luscious strawberries, goat's cheese and fresh watercress. It's dressed in deliciously french style, seasoned with distinct flavours of tarragon and Dijon mustard vinaigrette. It can be a perfect addition to cookout or BBQ meal. Although past week the weather isn't playing ball, we have been gorging on fresh and delicious salads almost every lunch time. In our house, salads gets warm welcome anytime, no matter whatever the weather we are having, actually we listen our bodies, when it requires fresh and healthy food we provide it. Couple of weeks ago daughter returned home for a break and requested for salads, not just for a day, every day, because she did indulge in takeaways and dine at many restaurants after finished her exams. So, since her return we have been making and enjoying some of our all time favourites salads and exploring new flavours with different and new ingredients. 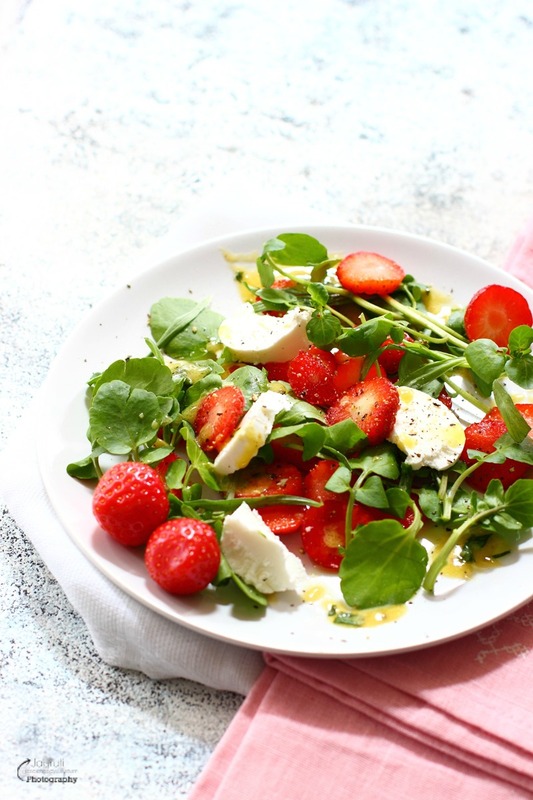 Strawberry, Goat's Cheese and Watercress Salad with Tarragon and Dijon Mustard Vinaigrette, was bang on and it blew us away . 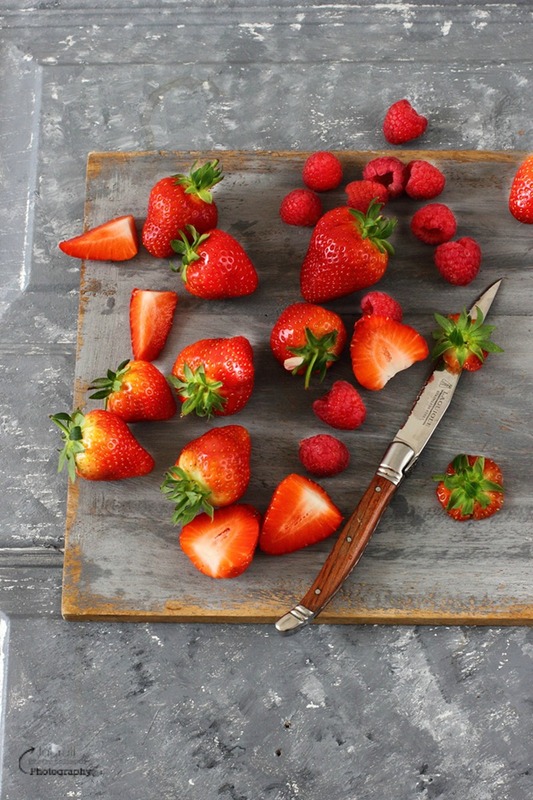 It is a stunning way to make the most of the summer's best produce. 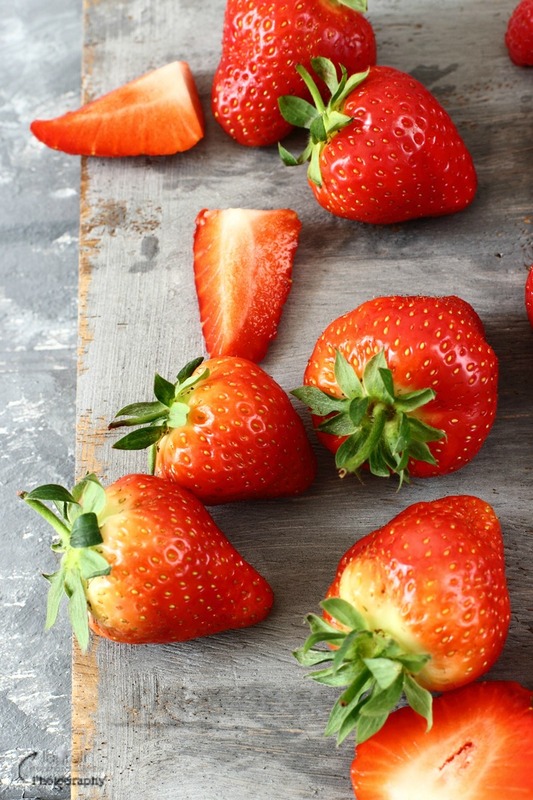 The perfume and flavour of the ripe and scarlet strawberry works great with tarragon, Dijon mustard and a splash of white wine vinegar and black pepper also make happy partners. 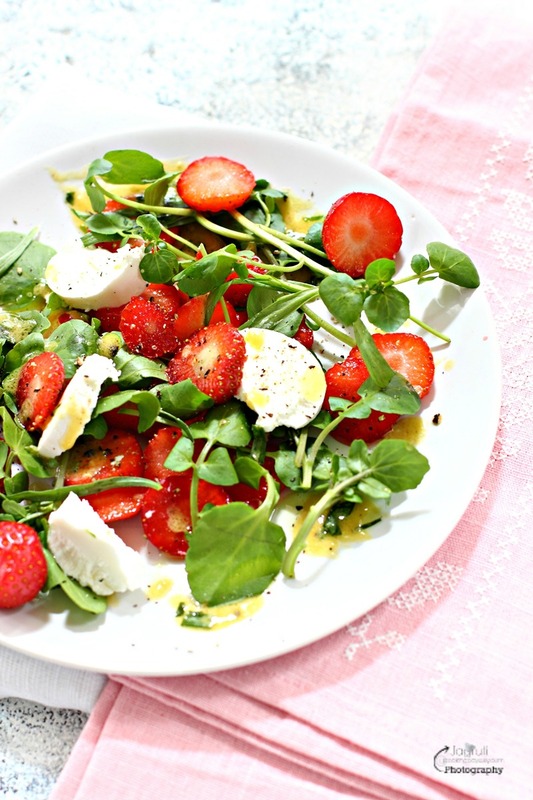 This lively salad captures the the essence of the early summer with the ripe strawberries. The addition of the fresh tarragon gives it a subtle and herbal taste. With soft goat's cheese, peppery watercress with nutritional powerhouse brings plenty of excitement to this salad. It's a great salad and can't wait to make it again! Delicious and great salad for summer ! In a big bowl mix together the Dijon mustard, sugar, vinegar and olive oil. Seasoned with salt and black pepper, then add and stir in the chopped tarragon and onion. 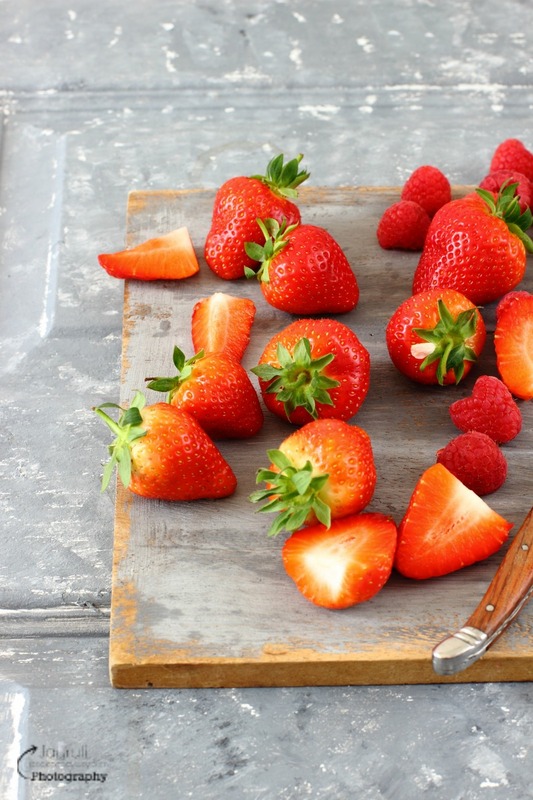 Slice and halve the strawberries , add in the dressing and toss to coat. Then add watercress and gently toss. Serve in a plate, add goat's cheese. Drizzle some olive oil , sprinkle black pepper and scatter some tarragon leaves over each plate before serving. Our strawberries are out in force so, I am going to get the kids picking away so we can make a version of your sald. Such a Gorgeous and Bright Looking Salad! I love the fact that you used watercress in it. Makes it really appealing me to me. Can't seem to have enough of it .Thanks for sharing!!!! This salad sings to me of summer. Love the textures and flavours! I love goat cheese! I make strawberry and goat cheese crostini! will try in a salad form.